“One part history, one part wake-up call, and all parts pastoral, Walton takes us on a transformative journey. Walton applies God's scriptural truth to the artifacts, sayings, and concepts that have formed the American imagination. With helpful historical context, he shows us how we got to where we are—and reveals the lies that we accidentally believe. With a unique combination of prophetic and pastoral, Walton gives practical and helpful tools to extract these lies and replace them with Jesus' truths and promises." "In this prophetically pugilistic book, Jonathan Walton has put into words so much of what troubles me about American Christianity. Like the best and most dangerous of interlocutors, Walton says things I'm not sure I agree with, breaks taboos I've been reluctant to break, and makes me think deeply enough to get uncomfortable. I recommend the discomfort of this book to every American seeking to take Jesus seriously today." "I grew up in a Chinese American church that espoused biblical inerrancy, but still I was indoctrinated by white American folk religion and its syncretistic beliefs. Jonathan Walton, like a prophet in the wilderness, speaks God's truth to power and unmasks the idolatrous ways of American Christianity. May we listen, repent, and follow anew Jesus' radical call to pick up our crosses and follow him." "In a society in which Christianity and American culture have become intertwined in deeply unbiblical ways, this book is a breath of fresh air. It not only offers a challenging cultural critique but it also offers a constructive vision for how the kingdom of God might look in the American context. I strongly recommend this insightful and timely book." "Wounds don't heal if they are infected. In Twelve Lies That Hold America Captive, Jonathan Walton uncovers the idolatrous assumptions and infected lies that get in the way of America and Americans pursuing real change, healing, and shalom. Whatever your ethnic background, this smart, honest, and challenging work will make you examine your own heart and help you sort out the difference between the life-giving gospel of Scripture and the presuppositions of the American dream. If knowing the truth can set us free, there's freedom from idolatry and blindness that's offered in these pages." "There's no denying that God is upsetting the American expression of Christianity in our time. Jonathan is masterful at jarring us and leading us all the same. It seems that the greatest obstacle to our nation experiencing the kind of peace we've longed for is continuing to believe that everything is okay. We need to cry—deeply and sincerely in order to begin to find the healing and freedom this nation needs. We need sharp and prophetic voices that are prepared to smash us to pieces for our own good. We need to be brought out of the deception of our own darkness and into the marvelous light of God's truth. I'd encourage anyone serious about their spiritual journey to take heed to Jonathan's words." "One part history, one part wake-up call, and all parts pastoral, Walton takes us on a transformative journey. Walton applies God's scriptural truth to the artifacts, sayings, and concepts that have formed the American imagination. With helpful historical context, he shows us how we got to where we are—and reveals the lies that we accidentally believe. With a unique combination of prophetic and pastoral, Walton gives practical and helpful tools to extract these lies and replace them with Jesus' truths and promises." "Jonathan has a way with words. Better yet, he has a way with truth—understanding God's multifaceted truth and the truth of our history as a nation. 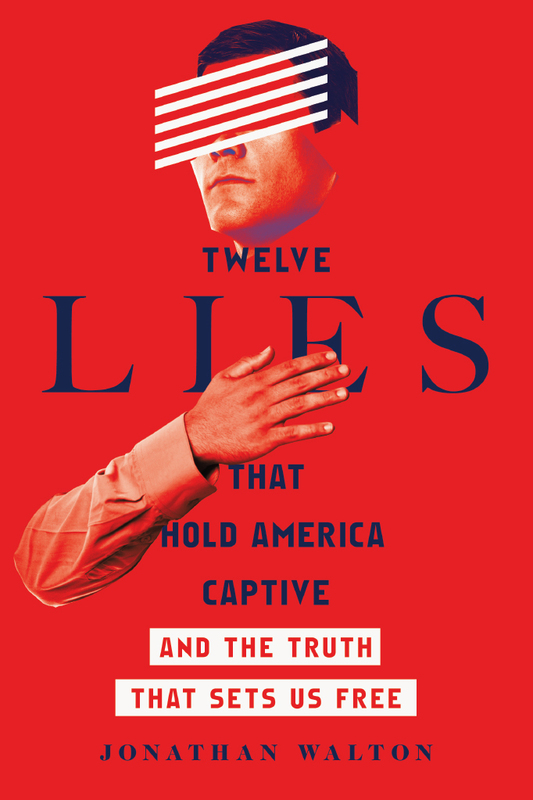 Backed with these truths, a wide swath of compelling experiences, and a thorough belief in grace, Twelve Lies That Hold America Captive builds a compelling case about our dangerous idolatry that cannot be ignored. Whether you lean politically left or right, be prepared to be called out and brought to the transformative call of Jesus." "Jonathan Walton has a great gift of speaking the truth in love. In an age when striking this balance is rarely held, he offers us a way forward that doesn't dismiss difficult truths about the United States of America, nor does he simply diagnose the problem without offering us a way forward. To bear witness to Jesus and his kingdom requires us to live in truth without sentimentalizing love. We cannot witness to the kingdom of God and be held captive to lies. Jonathan offers a compelling vision of what we can become, but only if we choose to see and reject the lies we've held." Enter your email to hear about news, events and ways to continue in conversations about justice, equality and hope.